And so we come to the penultimate instalment of The Five Untold Stories of Halo 5. 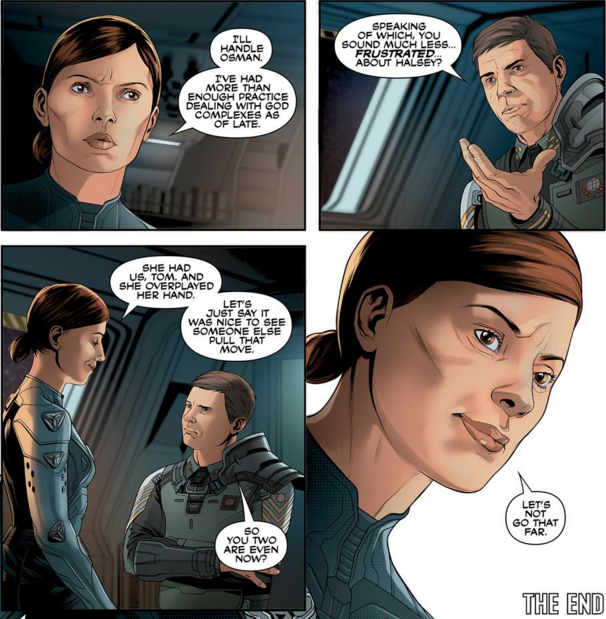 This is something I’ve had in-mind for three years now, a ‘resolution’ of sorts to the conflict between Catherine Halsey and Sarah Palmer that unfortunately didn’t get the best showing in the concluding issues of Halo: Escalation. At the end of the battle of Sunaion, where Fireteam Osiris deploys to the Guardian as it prepares to go to Genesis, we see Palmer and Halsey in a Pelican that is affected by the Guardian’s shockwave – Locke looking on in considerable worry as the vessel spirals away in flames. It is not until the epilogue of Halo 5 that we see Halsey with a battered, bruised, and bloodied Palmer in Thel’s camp – the story of what happened between that time (and between them) left untold. Until now. Throughout Spartan Ops and Halo: Escalation, one of the key relationships explored is that of Halsey and Palmer – it’s one that I found particularly engaging throughout much of Escalation because Chris Schlerf and Duffy Boudreau really started to move Palmer’s character forward. Palmer is somebody who very much sees the galaxy in black and white – good and bad. As a product of the generation that knew nothing but the Human-Covenant war, where those lines were so clearly defined, her perspective is an understandable one. But these stories endeavoured to make it clear that this perspective is not compatible with the state of the post-war galaxy. Halsey is very much the embodiment of what Palmer has to try to understand in order to puzzle out the ‘lexicon’ of the setting. 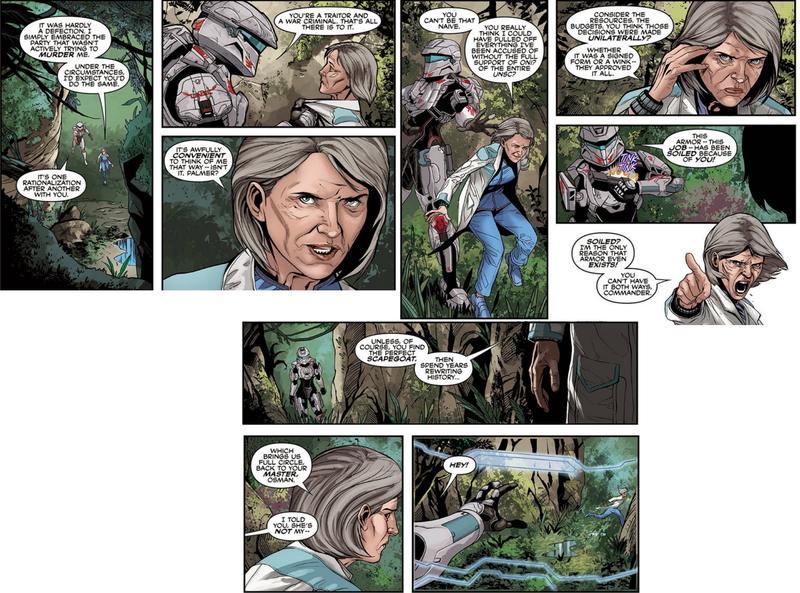 This becomes clear as she faces traitors from within her own ranks and loses Spartans because of it; how she allows her emotion to cloud her judgement when she sees Halsey, only to find that – for some reason – she just can’t pull the trigger. On some level, she knows that there is more than she understands. The Janus Key arc (Issue #13-16) deals with this particularly well, giving Halsey and Palmer the chance to properly argue with each other. Palmer’s belligerence costs her the other half of the Janus Key and Halsey escapes, leaving her with uncomfortable consequences and bolstering both her vendetta – but also that seed of doubt which prevents her from ending things with a single shot. It wasn’t quite the ending that the arc seemed to be leading to. Palmer learns nothing, in the end. She does not grow or change, she does not come away with any greater understanding of the grey in the Halo universe. Let us not forget that Halsey chose whose ‘side’ she was on when she temporarily gained control of the Absolute Record, saying that it was time to terminate her partnership with Jul – directing the Sentinels to fire on him and his troops. While she was ultimately interested in fulfilling her destiny, seeing the Librarian’s plan through, she did not display any intent to harm Palmer and the others. Unfortunately, while Halsey and Palmer do appear together in Halo 5, not many opportunities are afforded for them to meaningfully interact. In fact, across the whole game, they only share two lines together. Now, Halo 5 is not about Halsey and Palmer, and it’s also juggling a dozen other major characters as well. I’m sure that the writers wanted to do so much more with them, but it was beyond what was feasible. However, that does make the end of Escalation (which released after the game) sting a lot more. So, that context what this story has been written around: it’s time for Palmer to understand the truth, through which there might even be some reconciliation. This is the story that gave me the idea for this five-part series. It’s the one I’ve done the most work on over the last four months and the one I’ve enjoyed writing the most. I’d dare to say it’s one of the finest things I’ve written. I’m really happy with how this one turned out and very much hope you’ll enjoy it. Catherine Halsey was growing increasingly tired of the number of times she had found herself fearing for her life lately. Between the Office of Naval Intelligence ordering her assassination, resulting in the loss of her arm; forming a shaky alliance with Jul ‘Mdama in order to pursue her destiny – told to her by the Librarian herself – only to have it snatched away just as her plan was coming together, this year hadn’t been kind to the good doctor. And now she found herself in perhaps the most terrifying situation yet. She was helplessly at the whims of Commander Sarah Palmer’s flying. Halsey prided herself on being able to solve all the galaxy’s problems – all she needed was the time, resources, and freedom to do as she pleased – but, as their Pelican shuddered and banked hard due to something impacting on their left thruster, the only things running through her brilliant and calculating mind were enough curses to fill another half-a-dozen journals. Palmer angled the Pelican ninety degrees upwards, shooting the vessel towards the clouded cerulean skies of Sanghelios. Here, it didn’t matter that Halsey had been ‘chosen’ by some ancient Forerunner. In the face of such an immense construct, at the mercy of so many forces beyond her control, she was a speck of dust caught in cosmic winds. “Ready when you say, Commander,” Jameson Locke replied. He and the rest of Fireteam Osiris were holed up in the troop bay waiting to deploy to the Guardian, to follow it to… god knows where. As soon as Fireteam Osiris were clear of the troop bay, Palmer changed the Pelican’s course to get as far away from the Guardian as possible. A ball of energy had already begun to form at the thing’s ‘heart’, its phoenix-like wings locking into position to expel a final concussive blast before entering slipspace. Palmer fought to keep control of the Pelican as the shockwave washed over their ship, but they were spiralling out of control. The screens around them flickered and died. This is it, Halsey thought to herself. After everything, this is how it ends – crashing in a damned Pelican with the woman who took my arm. I’ll be seeing you. Very soon. Ahta ‘Dzoni had witnessed the end of the Covenant. Now the skies were empty. What little remained of the Covenant fleet was in total disarray; most of their generals were captured or dead, and Sanghelios itself – now bathed in moonlight from Qikost and Suban, which looked like the eyes of a disapproving god – seemed to shun them. As an Ossoona of the Covenant, Ahta’s role had been lacking in the honour he craved but was essential to ensuring the Covenant’s victory: gathering intelligence on the Arbiter and his forces, assessing the best ways to bring a final end to this bloody conflict. If the Covenant had failed, that meant he had failed. His brothers had fallen because of him. There was no greater dishonour than to fail one’s family. “Come,” spoke Cha ‘Kulma, pulling Ahta out of his self-pity. He stood atop a hill, his blue-grey Commander armour blackened by plasma scoring, made all the more visible by the glistening moonlight. Despite having lost the battle of Sunaion, Cha was stoic. Resolute. He had gathered the few survivors he could find – himself and another named Tsodon ‘Sakua – and they had set off into the cliffs. Beyond them stretched kilometres of rocky, closely-linked archipelagos that bordered the ancient state of Nuusra. Once, this place had been a paradise for the local fishing trade, where dive-hunters and fishing skiffs roamed the sea. An elusive dream of peace, one that seemed almost as mythical as tales of the Guardian itself. “As you say, Commander.” Ahta replied. The Librarian held out her hands, each one held half of a key. Doctor Catherine Halsey held out her hands, each one held half of a story. Catherine Halsey could hear something – what might’ve been the gentle crackling of a fire; she could smell… was that the sea? Have I made it? Am I home? She reached for her face with her hands – no, hand – to rub her eyes and clear her vision. No, Halsey groaned. No, can’t I just sleep? She was in the Pelican, which appeared to have crashed, and she was still be alive. The crackling sound was indeed a fire, but it was not the comforting heat of a log-filled hearth like the one she had enjoyed with Jacob so many years ago. And the smell… it was of the sea, but not of austere, rustic docks of Port Vernon on Endymion. Halsey’s eyes widened in shock. She sat bolt upright in her seat as she realised the flames were dancing just a few inches away from her face. Struggling against her seat’s restraints, Halsey fumbled clumsily with the strap’s release, and, upon finding purchase with a satisfying clack, she immediately scrambled towards the troop bay to exit the craft – hitting her leg on something that had been displaced on the ground. Glancing back briefly as she stumbled forwards, cursing at the pain in her foot, she saw the tusk-like tow cable of a Warthog on the floor. Why this appeared to have been disassembled from the vehicle and why it was even in the Pelican, she had no idea and did not care to speculate. All Halsey cared about was getting out. The sound of waves crashing against rock greeted her, along with the smell of salt that had, just moments ago, reminded her of a home she hadn’t thought about in years. Inhaling deeply, Halsey doubled over, resting a hand on her knee. She had never exactly thought of herself as being indestructible, but it was moments like these that made her realise the toll the last few years had inflicted on her body. She was well into her sixties now, but after years of turmoil – of loss, imprisonment (of one sort or another), imprisonment, and more battles than she could count – Halsey felt the weight of centuries pressing down upon her. Get to work, Catherine, Halsey told herself, scanning her surroundings. Focus! It wasn’t difficult to achieve this. The sound of the waves calmed and attuned her senses, and the air cleared her head as she slowed her breathing. Beyond the cylindrical desalination devices built into the city of Sunaion – which were used by the locals to extract materials from the Csurdon Sea – were small, interconnected islands of varying size and height. They were surrounded by jagged rocks that stretched back to a great cliff wall. It was only now that Halsey glanced over the edge of what she assumed was a small hill leading down to those islands that she realised they were much higher up than she’d anticipated. A thirty-foot drop to the waves below, at least. She looked back at the Pelican to find that it may have crash landed safely, but that was likely to change. Very soon. At least half of the vessel was perched precariously over the cliff. A choice lay before her now, and whatever she chose… there would be no turning back from it. A long time ago, she had held two data chips – two halves of a story – in her hands as she faced the Master Chief and delivered him an ultimatum. She had asked him to decide the fate of a single life, balanced against a chance for their entire species. “Why do you want me to make this choice?” He asked her. Fate has a cruel way of circling back upon those it seeks to test. This echo is the path of all wretched penitents – to face one’s sins around another corner, from another angle. Why should I save her? She’d leave you to die, wouldn’t she? 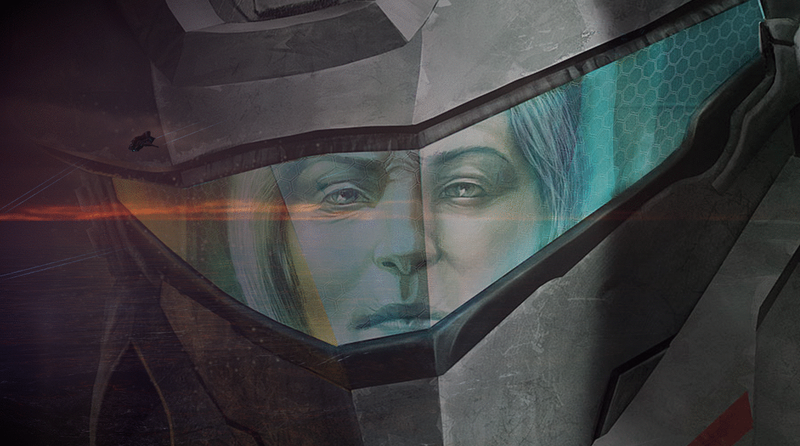 Her eyes met with the Master Chief’s reflective golden visor, where she saw the boy she had trapped beneath that armour. Planting the seed of that idea in the Chief’s mind was, at the time, the only thing she could think to do in order to atone for what she had done to him and the other Spartans. What’s one more amongst all the others? Halsey closed her eyes and took a last, deep breath. Ahta ‘Dzoni came to an abrupt halt as Cha ‘Kulma raised a closed fist to the group. His eyes were fixed on the horizon. “What is it?” Ahta asked. “Look.” Cha responded, prompting the Ossoona to join him and gaze out over the wine-dark sea. A thin column of smoke was visible on one of the tall, rocky islands. Ahta turned to Tsodon ‘Sakua, a Ranger, who had become known to the Covenant’s generals over the last few days for his belligerence over their many ‘tactical retreats’ for small future gains. Tsodon saw only the path forward, wherever it took him, and did not care for getting caught in a tangled web of complications. Cha ‘Kulma shared Tsodon’s frustrations, believing that a singular retreat should have been made to Hesduros – their base of operations – rather than wasting their increasingly finite warriors on a desperate, last-ditch attempt to claim victory. He held out the weapon to Cha, but the Commander shook his head and gestured to Ahta. Ahta gratefully accepted the weapon. He brought the scope to his eyes and looked towards their future. Halsey heaved with every ounce of strength in her. Get it together, Catherine! She scolded herself. You can do this. You can do anything. They were the words her mother had spoken to her a very long time ago – though, Halsey imagined that the choices she’d made in life up to this point weren’t quite what her mother had been referring to. Halsey had managed some productive tasks since she’d made up her mind. She had managed to locate a fire extinguisher to douse the flames in the cockpit (using her arm to hold the nozzle and her foot to apply pressure to the handle – it was about as graceful as it sounded). Palmer was no longer in danger of burning to death, but the Pelican was still perched on a very thin cliff that could give way at any moment and send them crashing – this time to their deaths. There had been a few sudden rumbles and lurches in the last few minutes that told Halsey her time was running out. The last thing of note she had observed was the ejector seat, which was capable of being effectively deployed at zero-altitude and airspeed. As one of the only things that the Guardian’s pulse hadn’t affected, it was the Commander’s best hope of survival right now. But there was, of course, a hitch. You’re overhanging a cliff, Catherine, she told herself. Tempting as it is, ejecting Palmer means that she’ll just fall into the sea. No Debussy, she cursed. No functional technology. No datapad… which means no Debussy – which means thinking is a hell of a lot harder! Stop it, she caught her brain getting stuck into a recursive loop, thinking about what she didn’t have rather than what she did. Rubbing the bruise that had formed on her leg from when she’d tripped earlier, the Pelican rumbled again – inching forwards as another part of the cliff’s edge gave way under the craft’s weight. She jerked forward, catching her breath as she heard the craft croak and strain. And as she looked up, she saw it. The Ossoona continued to stare through the beam rifle’s sights. Tsodon sensed that he would not win this argument. Every instinct of his screamed that this would lead only to further ruin – that they were repeating ‘Mdama’s mistake. But it was two against one and he was outranked. A warrior must know when to capitulate. She was as much a prisoner here as she was with the UNSC and Jul ‘Mdama. “Go disassemble a Warthog,” she replied without looking up from her datapad, sweat trickling down her forehead from the heat. And she had certainly not anticipated that this would now save Commander Palmer’s life. But that wasn’t to say that this was going to be easy. She would have to swing the tow cable through the shattered window of the cockpit, get back inside to hook it onto the seat, and then find a means to ensure that the spool remained in a fixed position and didn’t simply fly off when Palmer was ejected. There was no time to agonise over the theory. Now was the time for action. You can do this, Catherine. You can do anything. Shipmistress Mahkee ‘Chava gave a last look back at her crashed Phantom, holstering a carbine over her back and attaching a plasma pistol to her armoured thigh. These were not her weapons, but they would have to do – perhaps their use might mean that those who had perished in the crash would not have died entirely in vain. Little as Mahkee cared for some of the more frivolous traditions of the Sangheili, this was how they had long honoured their fallen on the battlefield. A fallen warrior’s weapon is sacred, your duty is to carry their soul to victory with your own. Perhaps, now that this war was over, that the Swords of Sanghelios had won, there would be time to mourn. Perhaps she could find her lost child and bring him home. Mahkee pushed these thoughts to the back of her mind. She was part of something bigger now – bigger than what she wanted for herself – and, by Urs, they had countless wounds to heal across the galaxy in the time ahead. Her objective now was to find her allies, something that would prove to be difficult with no ship and no means of communication. All she could see was a thin column of smoke in the distance, rising from a tall, rocky island – about a kilometre away. What waited for her there – friend or foe – she had no idea, but it was her best chance. A true warrior does not turn from the storm, but walks into its heart. Halsey had made sure to seal Palmer’s helmet to her head and double-checked that she was strapped in. Outside, there was a crevice in the rock wall that had just managed to fit the Warthog’s disassembled cable spool. The tusks were capable of being retracted, which had enabled her to fit it inside the rock – she had then extended them again, which ‘trapped’ it and ensured it wouldn’t simply fall out. She had tested the controls on the side to ensure that they still worked, which, mercifully, they did. Stepping into the Pelican to enact her plan, Halsey felt a very final-sounding rumble. The craft began to pitch forward. Oh crap! She threw herself into the cockpit and yanked the ejector seat. Then, she turned and sprinted back outside to the cable. Time seemed to slow, much like the sensation her Spartans had described to her. Penny in the air, Halsey thought, every muscle in her body tensed. Palmer hung in the air and the Pelican gave a final low groan before time caught up with Halsey again. Penny drops! She slammed her hand on the spool’s ‘pull back’ control. The chair was violently yanked back by the cable, its parachute deployed, and the Pelican toppled off the cliff and exploded into a column of flame. It wasn’t a soft descent for the Commander. Anyone else in her position would’ve been pulverised, breaking every bone in their body, risking a move like this – but that wasn’t as much of a concern for a fully-armoured Spartan. With a thunderous crash, the chair impacted on the ground – just half-a-metre away from the cliff edge. Panting, Halsey slumped back against the rock wall to catch her breath. And then she began to laugh. Looking up, Halsey saw Palmer – still strapped into her chair – was being dragged very slowly across the ground as the cable continued to reel back. It was unclear whether Palmer was still unconscious or if her armour had simply locked up from the gel layer taking the brunt of the impact, but seeing the unceremonious position the Commander was in doubled Halsey over with another fit of laughter. Halsey cursed the Guardian for its attenuation pulse knocking out her datapad so she couldn’t record this spectacle. This would make for fine viewing as a ship-wide broadcast on the Infinity. “I think we’ve got a conversation to finish, Commander.” Halsey stood, remembering their last confrontation at the Absolute Record. Palmer continued to drag along the floor. Now that the words came to her, after being silenced for so many years, she found she couldn’t stop. She sighed, leaning over to stare into Palmer’s visor – seeing only her reflection in it. “You see this universe in black and white, everything has to conform to that binary for you because it makes your job easy. But you’ve started to see the cracks in that, haven’t you? That’s why you haven’t been able to kill me when you’ve had the chance. The column of smoke erupted into flame as the human craft fell from the cliff to the depths of the Csurdon Sea. She hoped that whoever had been aboard that vessel managed to escape before what would’ve been quite an unceremonious end for any warrior – the same end her own troops had seen… the same end she had almost suffered, a long time ago. Regardless, she would know for herself soon. From her position atop the cliff wall that surrounded the archipelagos, she saw three fast-moving figures making their way up to the raised island where the human vessel had fallen. Though she could not make out any details of the three figures under the dark, their silhouettes were clearly Sangheili – meaning that they were either Swords of Sanghelios troops, who she was looking for anyway; or they were Covenant who had not been claimed by the battle or the Guardian, which brought the duty to her. She thought it strange that she had once seen eye-to-eye with her mate’s perspective on humans – that there could be no peace, that after having been driven back so violently by the Covenant, it was violence in equal measure they would employ to colonise once again – but now, having met them herself, she felt a strange kinship with the ‘Demons’ who had fought with her. And so she understood why the Arbiter was right to pursue reconciliation rather than preparing for vengeance. It was not from without, but within, that the greatest threat to the Sangheili lay. Others certainly existed, and there were many humans who naturally hated and plotted against them, but so many of the consequences they had suffered through in what many called the Blooding Years were ones of their own making. Now was the time to find themselves again. To forge pathways out of darkness and deal with their newfound responsibility, which came with throwing off the shackles of the Covenant. Mahkee suppressed those thoughts and hastened her pace forward, drawing on her battle-wisdom to find a suitable location to scout their position and, if necessary, to quickly intervene. 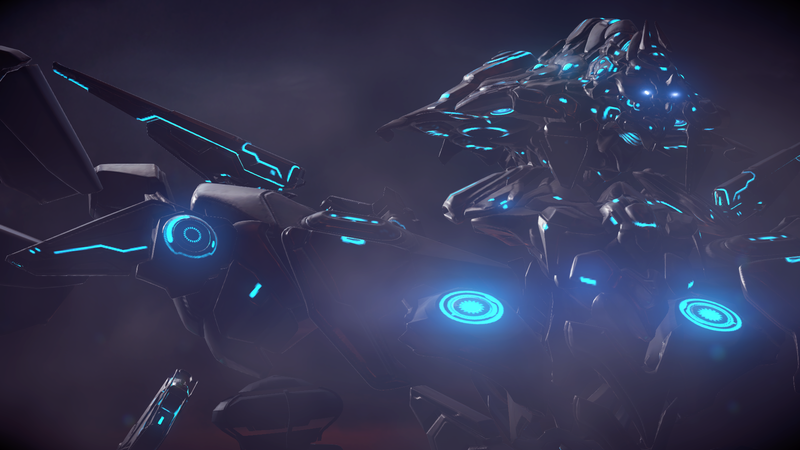 Halsey was pulled from pontificating further by the sudden arrival of three Sangheili, clad in armour that made it clear they were not Swords of Sanghelios. Her mind filled with questions: were they here to ‘rescue’ her? Kill her? Had they overheard the things she’d said? One of them – the leader, judging by his armour – stepped forward. Think fast, Catherine. Her brain whirred into action. How are we going to get out of this one? Although she was probably about to die, Halsey appreciated the Sangheili’s wild overestimation of what she knew. The mention of Palmer, who had now completed her voyage of being dragged across the ground by the tow cable, gave her a sudden idea. The three Sangheili exchanged glances before Halsey continued. “It is not us who are in a pitiful position, nishum,” the one who spat earlier said. His hand was close to his energy sword, but he did not draw it – as it was with Sangheili traditionalists, a warrior did not draw a blade they did not intend to use. “Perhaps she speaks the truth, Tsodon,” the other subordinate spoke. The three Sangheili fell to bickering amongst each other. Halsey wondered whether they might actually end up killing each other over their ‘disagreement’ with each other, she could almost see the tingle in Tsodon’s hand by his energy sword. Eventually, his discipline would snap and someone would be on the other end of it. If there was one thing Halsey hated above all else, it was not being able to take action – not having a say in how things could go, not being able to tip the scales in some way. Three desperate Sangheili warriors who had lost everything against an elderly, one-armed woman and an unconscious Spartan were not odds she was keen to take on. Tsodon’s shields burst, and before he could even react a carbine round struck him in the head – dispatching him immediately. The leader and his subordinate doubled back in horror as Tsodon fell to the ground before them. “By the–” Ahta did not get to finish speaking before he too was on the receiving end of a barrage of carbine rounds, breaking through his shields and penetrating his chest. The leader watched, shocked, as the Ossoona stumbled backwards from the impact and fell from the cliff edge to be claimed by the sea. This new combatant tossed their carbine aside and leapt from above, immediately transitioning to a combat roll towards Tsodon’s body and snatching up the fallen warrior’s energy sword. In one swift motion, the warrior ignited it and brought it to the Covenant leader’s neck. In the second that passed, the leader’s mandibles slackened as he saw the pale skin of who had bested him – recognition dawning on his face. The blade severed his head from his body. It had been the most peculiar dream. A daring mission, speeding towards an immense Forerunner construct – on the Elite homeworld, of all places! A timely escape, the Guardian let out a concussive blast that shut down all power in the area, including her Pelican – she’d managed to keep control of the craft just long enough to get to safety. A war criminal, not quite the co-pilot she would have chosen, but fate had an annoying habit of bringing her and Catherine Halsey together in dire circumstances. Damn, Palmer thought as she likened this to one of the old films her adoptive father had sat her through a thousand times over. She had been slipping in and out of consciousness, trapped inside her armour as the gel layer locked up the suit from the impact of the crash, but from what she’d gathered… Halsey had been the one who had rescued her. Then, she had talked to her – no matter how hard Palmer’s mind had fought, she hadn’t been able to talk back. So, she did something she never expected. No matter how much she hated Halsey, no matter how much more she wanted to hate the old woman for saving her life, she at least owed her that. Sound, sight, and sense flooded back to her in a moment, and she realised that she was being carried – her head pointed at the ground. She saw the tracks first, footprints in the sand, like large hooves. “She’s waking up,” Halsey said, picking up her pace to catch up with the Elite that had Palmer slung over her shoulder, which brought them to an abrupt halt. “Yeah,” Palmer got her bearings and slowly got up to stand, the Sangheili holding out her arms to catch her if she fell. Palmer resisted a snappy retort and turned to the Elite. She was clad in crimson armour with ivory decals and markings, and her skin was uncommonly pale – at least, compared to those she had seen in the Swords of Sanghelios’ camp. Mahkee tossed her plasma pistol to Palmer, who reflexively caught it. “Thanks,” Palmer said, but, confident the Spartan had sufficiently recovered, Mahkee was already heading off to scout ahead. Halsey put her hand on the weapon. Palmer cursed how difficult the old woman made it to like her. A moment passed between them. Halsey’s hand still rested on the weapon. Palmer gently pressed it into her hand; she nodded, then turned to follow Mahkee. A ‘thank you’ would be nice, Halsey bit back saying. Oh, don’t push your luck, Doc, Palmer had prepared to retort. They would never be friends, but she sensed that – for the first time – they understood each other. Alex, you’re an amazing friend, and somehow, an even better creator. Thank you. My goodness, Pratchett is not a comparison I was expecting but I’ll take that! And yeah, that really is the heart of it. There are no easy answers to difficult questions, no simple ways out – Halsey knows that more than anyone, and that’s why she can’t fulfil any sort of grand destiny. She has to fail as a ‘chosen one’ because her real work comes from how she is compelled towards getting one step out from under the shadow. I can definitely see why this is one of your favorite works. The creativity of the situation Halsey had to rescue Palmer from (and the solution she came up with) was grand, and the added character you’ve given to Mahkee is very welcomed. Heh, I do feel the need to pat myself on the back for this one. I’ve had the basis of the idea in my head for three years (I even alluded to it in the Halo 5 level-by-level analysis), but the specifics of this story came to me as I was climbing Mount Vesuvius during the summer. Oh, I have some VERY specific ideas about Mahkee which I slightly allude to in this story. Should I ever get the privilege of contributing to canon, you can bet that she’ll be one of my top priority characters to expand on.